Son of Obed and Sarah Daniels, of Godstone. 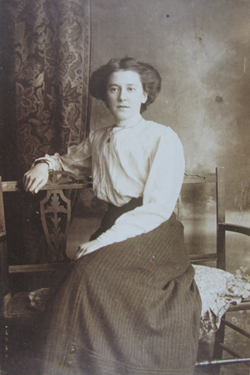 Husband of Alice Amelia Skelton (formerly Daniels), of 44, Diceland Rd., Banstead. George Daniels was born in Godstone, Surrey, in 1896. He was the son of Obed, a labourer, and Sarah Daniels. He was baptised at St Nicholas, Godstone, on 10th May of that year. George was the eldest of three siblings: Rose (known as Kate) and Obed were born in 1898 and 1900. They lived at Malthouse Cottages in the village of Godstone. George’s father, Obed, died aged 46 in 1904, when George was just 8 years old. Sarah remarried, to John Preston, a gardener, and the family lived in Sarah’s home town of Caterham where John and Sarah went on to have at least three children together (Nora, Nellie and Henry). In 1911, they were living at 4 Market Parade, Brighton Road, Coulsdon, and George had started to work on a local farm. George either moved out of the family home or the family moved to Woodmansterne sometime between 1911 and 1914. Here George must have met the Lee family. William and Ellen Lee had at least nine children and George was a contemporary of the younger Lees: Kate, Walter and Alice. 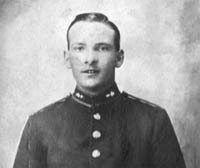 George joined the Royal Garrison Artillery in August 1914, enlisting at Croydon. He lied about his age, claiming to be 19, old enough to serve abroad, when he was only 18. The older Lee brothers (John and Edward) had both joined the R.G.A. pre-war and maybe the stories that they told influenced George’s decision. George was posted to the 15th Siege Battery. The 15th Siege Battery was formed from drafts of existing R.G.A. units at Sheerness, Kent, on New Year’s Eve 1914. They spent February to May 1915 in Lydd where they trained and practised firing their four 6-inch 30cwt howitzers in the empty spaces of Romney Marsh. They then moved to Fort Fareham, Hampshire, to join the 16th Siege Battery and 283 Mechanical Transport Company of the Army Service Corps to form 19th Heavy Brigade, R.G.A. George was based at Fareham on 14th May 1915 when he married 18-year-old Alice Lee, who had moved to 44 Diceland Road, Banstead, with her parents. Both of them claimed to be 20 years old when they signed their marriage certificate. 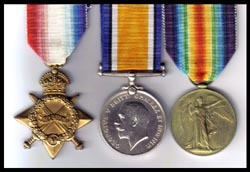 George’s battery sailed to France on 11th July 1915 and he went with them, one of 209 “other ranks” in the Battery. They disembarked at Le Havre on the 12th. Plenty of hard marching followed with the guns suffering during their travels, as no doubt did the men! On the 27th, they met up with the rest of the 19th Brigade at Ferfay and on the 28th they joined the 3rd Army, X Corps, at Naours. They were in the chalk grassland of Picardy, the country through which the Somme and the Ancre flow. This was a quiet sector that had seen no major fighting and it would be 11 months before the British Army suffered 57,000 casualties in Picardy in a single day on 1st July 1916. There were few heavy guns available in that area and so the Battery was split into two sections of two guns. 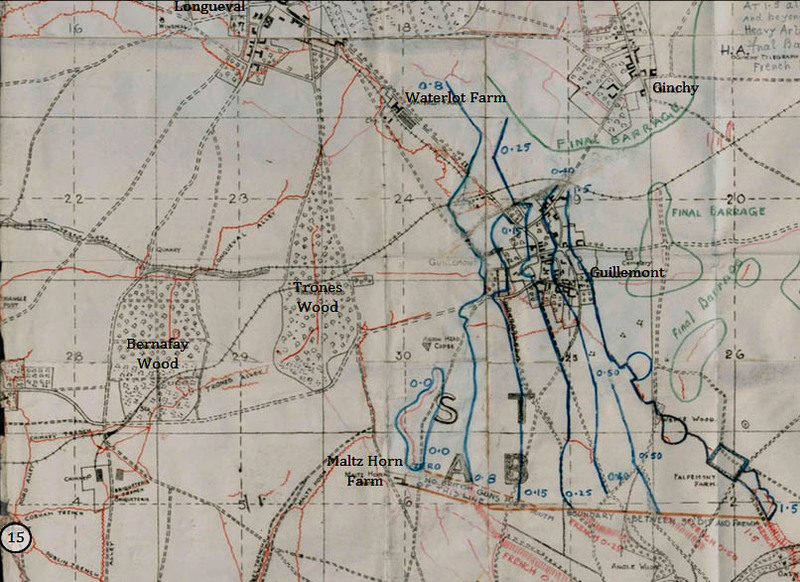 No.1 Section sited their first gun in a copse near Meaulte, south of Albert, the largest town in the region. On 3rd August they fired 3 rounds of Lyddite (high explosive) on the village of Fricourt, at the apex of the corner of the German line, where it bent from north-south to west-east. These were the first shots fired in the war by X Corps. They set up an observation post on a spur overlooking Mametz and brought up their second gun. They were soon regularly bombarding the trenches around Mametz and Fricourt. No.2 Section laid platforms for their guns at Martinsart, north of Albert and west of Thiepval and Ovillers, on the 1st August and emplaced their two guns on the 2nd, working to improve their position over the next few days. They first came into action on 6th August, registering on Mouquet Farm (at a range of 5,500 yards; the howitzers had an effective range of 7,000 yards) and the village of Pozieres. They soon settled into a routine and two guns were in action most days, often shelling the twin fortified villages of Ovillers and La Boiselle which were near to the front line or targeting retaliatory fire on Thiepval, on a ridge set further back from the lines. Both sections would be assigned as artillery support to specific units, responding to telephone calls or signal flares from troops on the ground or artillery observation planes, but they would also often act on their own initiative and if their observers spotted German activity then they would shell them. From their commanding observation points they were even able to see that a German soldier had had his trousers blown off following one salvo! Back home, Alice’s father, William, died in August and was buried at St Peter’s in Woodmansterne. If she didn’t know it before George left, she would by now: Alice was expecting a baby. The Battery were moved periodically to wherever their guns were needed most, the first move coming in September, to rejoin the rest of 19th Brigade in positions either side of the village of Berles-au-Bois in support of the French 9th Corps. Berles was north of their old positions, nearer to the town of Arras and away from what would become the Somme battlefield. Their guns were sited and in action by mid-September and they began to target enemy batteries, a dangerous game to play. Their guns were large-calibre, long-range howitzers, mounted on wheels for transport but on platforms when firing, capable of inflicting great damage from faraway with high-explosive Lyddite shells or armour-piercing rounds. Typically, their targets were at least 3,000 yards away and so they were safe enough from the usual danger of trench warfare that the lighter guns of the Royal Field Artillery and the Royal Horse Artillery sometimes had to put up with but they were still within range of their German heavy-gun counterparts and as battery detection methods evolved and counterbattery fire improved, the risk to the men of the R.G.A. increased. On 21st September, the first report of German counterbattery fire is recorded in the Battery’s war diary and then again on the 22nd, when No.2 Section (who had “much annoyed” the Germans) were shelled; one man was wounded. The Section withdrew to new positions at night. Shelling enemy batteries was like poking a hornet’s nest but it was a necessary part of the preparation for an Allied offensive that began on 25th September 1915. The northern part of the attack (the Battle of Loos) is more well-known to us in Britain but that was just the northern tip of the battlefield and the major attacks were carried out by the French to the south. The French near Arras made gains and captured the Ficheux Ridge, thanks in part to many batteries like the 15th. No.1 Section were bombarding 6 German batteries (never the same battery twice in succession) on that day and the next, and No.2 Section were targeting batteries, crossroads, houses and trenches. No.1 remained at Berles-au-Bois, where they began to use a 30-foot periscope sited only 600 yards from German lines to aid their observations. There was little hiding it and erecting it often brought hostile fire on the men manning it (“time to first bullet 10 minutes”) before it could be brought into proper use. On New Year’s Eve 1915, the first anniversary of the formation of the Battery, the officer keeping the diary for No.1 Section recorded that his section had fired 2,055 rounds (an average of about 20 per day) and at midnight they “prepared to usher in the New Year with a salvo at the German trenches to show in what spirit the battery enters the year A.D. 1916.” They fired 2 Lyddite shells, one of which exploded but the other - “bearing a suitable inscription” - did not. No.2 Section returned to Martinsart in October before moving back north to Bienvillers-au-Bois, northwest of Gommecourt and nearer to No.1 Section. There had been some difficulties in aiming due to variations between batches of shells but no shortages since they had arrived in France, despite the munitions crisis that brought down the government in May of 1915, until 8th January 1916, when for the first time No.2 Section were unable to support the infantry due to lack of ammunition. They were only able to fire 2 shells in the following week. No.2 Section were on the move again in February, to Riviere (slightly closer to Arras), establishing their new position over several days whilst the immediate area was under a constant German bombardment. This left No.1 Section to cover more than the entire frontage of a whole infantry division. Good news came in early 1916: George and Alice’s daughter, Ellen, was born. The Battery’s war diary ends on 31st March 1916 but they must have been withdrawn from the front line shortly afterwards and on 3rd June they were rearmed with four 6-inch breech-loading 26cwt howitzers. This increased their effective range to over 9,000 yards. They transferred to the 31st Heavy Artillery Group on the 7th, at the previously sleepy town of Bray-sur-Somme which had now become a hive of activity in the buildup to the “Big Push”. They were joined by 12th, 25th, 49th, 85th and 113th Siege Batteries to form the left group of XIII Corps Heavy Artillery for the coming battle. XIII Corps were in the southern sector of the British line on the Somme and would be attacking northwards towards Mametz and Montauban while other British forces to the north (and French in the south) attacked eastwards. The battery commanders were briefed on the 18th and the guns of the 15th Siege Battery trundled into their pre-prepared battle positions on the 19th and began registration of their targets. The attack was scheduled for 29th June, which was to be known as “Z” Day. A 5-day preliminary barrage was to begin on “U” Day, the 24th June, and was to be the largest bombardment ever seen. The 15th Siege Battery would mainly be targeting German batteries but they would also take part in periodic intense bombardments at irregular intervals, usually aimed at the fortified villages of Montauban (near the front line) and Longueval and Guillemont (part of the German second line of defences). These were incorporated into the artillery bombardment so that the intense bombardment that would immediately precede the actual attack would not appear out of the ordinary and give the Germans warning of the attack. On the eve of the attack, it was seen that the bombardment had not done its job: wire had not been cut well enough and defences still stood. The attack was postponed for 48 hours and an additional two days’ bombardment was ordered. Registered on a hostile battery at S20d1040 spotted by an aeroplane. 2210: 24 rounds fired at Longueval as part of a 5-minute intense bombardment of Longueval, Montauban and Guillemont. 0800: 150 rounds fired at a hostile battery at S28G8010. 0930: 20 rounds on Longueval, part of a 5-minute intense bombardment of 83 shells on the village. 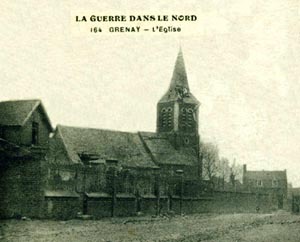 1145: 20 rounds on Guillemont, part of a 5-minute intense bombardment of 64 shells on the village. 1530: 16 rounds on Longueval, part of a 5-minute intense bombardment of 74 shells on the village. 1630: 14 rounds on Guillemont, part of a 5-minute intense bombardment of 58 shells on the village. 0700-0900: bombardment of front line and support trenches. 0900-1020: shelling the Glatz Redoubt, face of Dublin Redoubt and Germans Wood. 1120: bombardment of front line and support trenches. Remainder of day: reserve trenches and communications trenches. 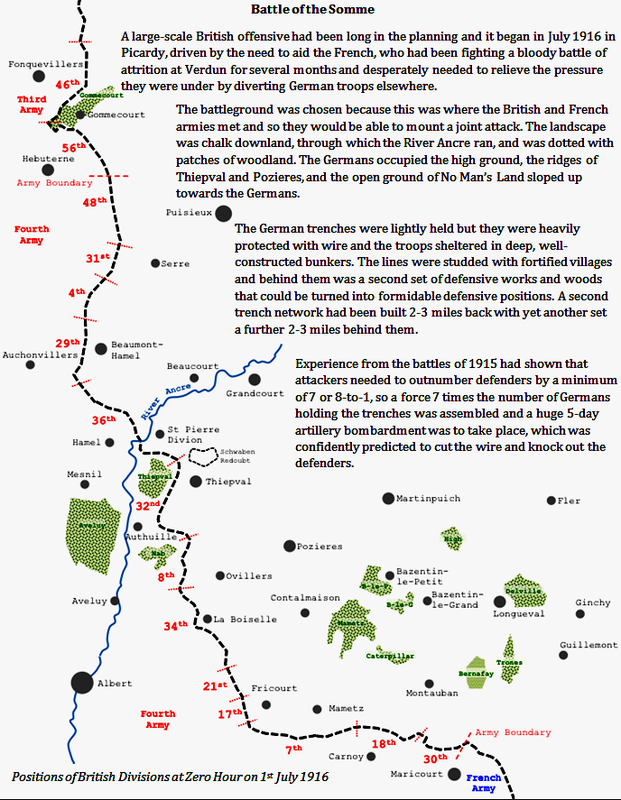 0900-1000: bombardment of front line and support trenches. 1215-1245: concentration on Germans Wood. Remainder of day: front line and support trenches again. 0900-1000: Breslau Trench, Breslau Support, Breslau Alley, Brick Point, Valley Trench, Brick Lane, Back Lane trenches (between Montauban and Mametz). Remainder of day: bombard trenches between Breslau Trench and Breslau Point. Orders came through on “Y” Day that the attack would be postponed 48 hours to allow further bombardment. 1700: Intense bombardment of Longueval. All day: concentration on Glatz Redoubt, Warren, Train Alley and trenches behind the craters in No Man’s Land south of Mametz. “Z” Day was 1st July. The attack was scheduled to begin at 7:30am, preceded by a 65-minute intense bombardment. Daybreak came at 4:50am and the batteries began to target strongpoints. At 6:25am they switched to the German front line trench system. At 7:30am, as the first wave of infantry began to advance, they began a predetermined schedule of lifts to objectives progressively further behind the German front line. At 10am, showing some rare flexibility not evident elsewhere during the day, they switched from their schedule to support the infantry in repelling counterattacks and also hit key points behind the German’s new defensive positions to disrupt the massing of troops and hinder movement. The attack in the south of the Somme battlefront went well on the first day, thanks in no small part to good cooperation between artillery and infantry. The attack to the north had seen little success and it was decided that a renewed thrust would be made from the south. On the 2nd, they reverted to counterbattery fire as well as continuing to shell points in the German rear, including the villages of Longueval and Guillemont. This continued for the next couple of days as the offensive in the south crept painfully forwards. During the night of 4-5th July, the 15th Siege Battery carried out a bombardment of the German second line system near Longueval and Guillemont Station and then fired on machine-guns in Trones Wood, one of the next obstacles to overcome following the capture of Caterpillar Wood and Bernafay Wood on the 4th. Throughout the rest of the day they concentrated on Longueval. The pattern repeated that night and the next day. On the night of 6-7th, they bombarded Longueval, Waterlot Farm, Sabot and Flatiron Copses and Bazentin-le-Petit Wood. Longueval and Bazentin-le-Petit were to be among the first objectives of the resumed advance, which was still waiting on the capture of the preliminary objectives of Mametz and Trones Woods. During the day (and the next), all of the XIII Corps batteries fired on the northern tip of teardrop-shaped Trones Wood, where it keyed into the German’s second band of defences, and the trenches around Maltz Horn Farm (south of the Wood). There was a trench running north-south through Trones Wood with the standard German deep dug-outs in which the defenders were largely safe from the shells of the artillery. The bombardment would have inflicted few casualties but it did stop the Wood from being reinforced from the trenches in the north. The villages of Guillemont and Ginchy, secondary objectives for the upcoming attack, were targeted to reduce the defences there to rubble and to prevent reinforcements from gathering; the village of Bazentin-le-Grand and its wood, primary objectives, were hit. Longueval and the German trenches were fired on again on the 9th and all batteries bombarded Trones Wood once more on request of infantry who were trying to capture the Wood. An intense bombardment of the second line trenches was carried out on the 10th and 3 concentrations (most or all batteries firing on the same target) were targeted on Delville Wood, behind the village of Longueval. An attack was taking place to capture the village of Contalmaison (on the eastern flank of the proposed new advance) and the 6-inch howitzers, including the 15th Battery, fired on Sabot Copse and Bazentin-le-Grand. At night, Trones Wood was attacked again and XIII Corps Heavy Artillery were in support. George’s battery joined 33 H.A.G., XIII Corps’ right siege and heavy group, on 11th July to support the coming attack on Bazentin Ridge. After the successful advance during the first few days of the Somme offensive, the Battery had moved forward and were now situated on the Glatz Redoubt, a German defensive fortification to the east of Montauban that they had been bombarding a few days before. Planned bombardment by XIII Corps Heavy Artillery in support of the 14th July advance, with position of 15th Siege Battery marked. Each large square (solid line) is 1000 yards wide. 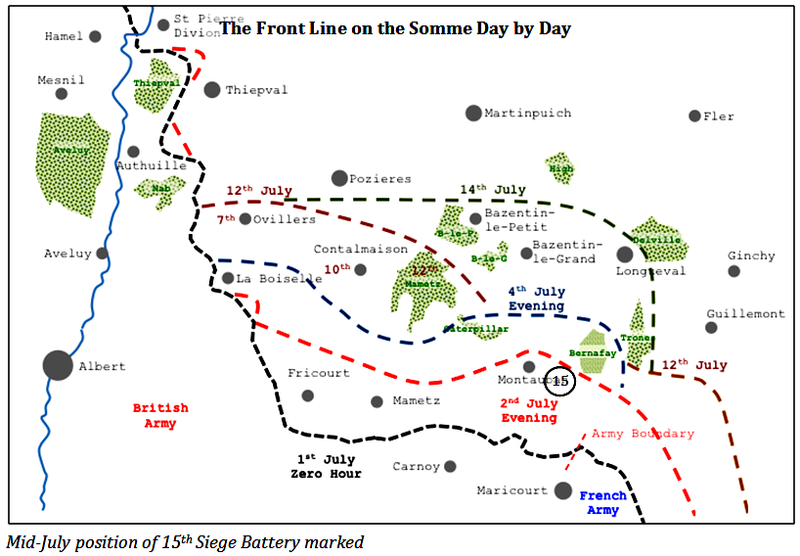 The red lines are old German trenches pre-1st July, blue lines are the lifting barrage (with numbers indicating the time after Zero Hour at which the barrage will lift to the next line) and green lines mark the final barrage areas. Trones Wood, the last remaining preliminary objective, held out and was finally captured on the morning of the 14th as the main advance began. The attack was a success and the villages of Bazentin-le-Grand and le-Petit fell, as did Longueval. A foothold was gained in Delville Wood and there the advance ground to a halt. The situation was confused and it was not clear to the XIII Corps artillery commander who controlled the Wood from day to day. When not bombarding the Wood, the 15th Siege Battery were probably sometimes used for wire cutting, not something that the heavy guns were particularly well suited for but at which they managed to achieve some success with full charge shells, but their main role was counterbattery work. This was aerially observed when the visibility was good and when an aeroplane was available but the visibility was often poor and so they fired on previously sighted battery coordinates in the hope that the German gunners would still be there. A tremendous quantity of shells were fired but there were many duds and there were problems when some of the fuses would not fit the shells. The constant shelling took a toll on the guns, the sight brackets and recuperators (which used some of the gas from firing a shell to return the gun to its firing position after recoil) of the howitzers were particularly vulnerable. There were not enough spare parts to go round and many were put temporarily – and some permanently - out of action. The batteries came in for “a great deal” of heavy artillery fire as the Germans reinforced the south of the battlefront and it was particularly noticeable from the 22nd July onwards. As well as conventional shells, tear gas and poisonous gas shells were used too. On 23rd July, as 15th Siege Battery were supporting an attack on Delville Wood, George was hit by shrapnel and his left thighbone was fractured. He was evacuated and shipped home to England to be treated at Salford Royal Hospital. The wound did not heal well and his leg began to haemorrhage after a few days, probably as the result of infection. Gangrene set in and George died of blood poisoning on 12th August. He was 20 years old. George was buried at All Saints, Banstead, on 17th August. He was the first man buried at All Saints to have died as a result of combat and he was buried with military honours. His coffin was shrouded in the Union Jack and borne to the grave on an Honourable Artillery Company gun carriage. A firing party and buglers from the Welsh Guards (based at nearby Tadworth Camp) were by his graveside. There were many “beautiful” floral tributes and the service (which was of an “impressive character”) was well attended. Alice remarried but her second husband also died of wounds sustained in the war. She remarried again and her son by her third marriage, Ted Bond (also a gunner), tolled the bell at All Saints Banstead on the 100th aniversary of George's death. 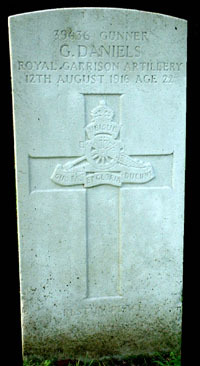 George’s headstone inscription, chosen by Alice, was to have simply said “Rest in Peace” but his stone is inscribed in one of the standard Commonwealth War Graves Commission formats: regimental badge on a cross, service number, name, regimental details and date of death. He is buried a few yards from Alice’s second husband. George’s death followed soon after that of his cousin, Thomas Stracey, a private in The Queen’s (Royal West Surrey) Regiment, who drowned in the Persian Gulf on 26th June 1916. Alice’s older brother, Edward, served with the Royal Garrison Artillery and was killed during the war. George’s brother, Obed, was living in Ferndale Road, Banstead, by 1923. 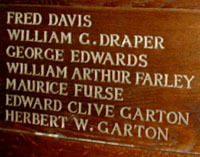 Last name inscribed on the Wood panel in ALL Saints Banstead ie appears out of alphabetical order. Son of Frederick and Eleanor Davis, of "Dehra Doon," Lyme Regis Rd., Banstead, Surrey. Fred Davis attended Sutton Grammer School from 1905 to 1911. Soon after the outbreak of war he joined the 15th Co of London Civil Service Rifles. In March 1915 he went to France and became batman to an officer. On the morning of September 2nd he was killed by a German shell and was buried in the little churchyard of Bully Grenay. The cemetery at Maroc was just behind the firing line at the time and during the greater part of the war it was a front-line cemetery used by fighting units and field ambulances, and protected from German observation by a slight rise in the ground. 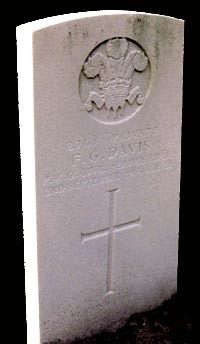 Pte Davis in Plot III, was one of the graves brought in after the Armistice, from the battlefields and small cemeteries north and east of Grenay. 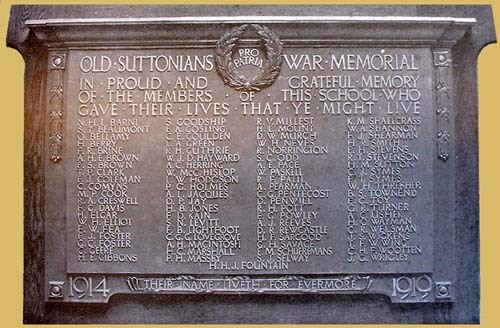 Fred Davis is one of the eighty-one men listed on the Old Suttonians' War Memorial which still hangs proudly at the School. 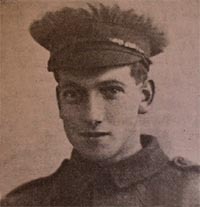 Frederick George Davis was the second son in the family to die during WWl as his step brother Charles Edward Couchman died two years later, in September 1917. 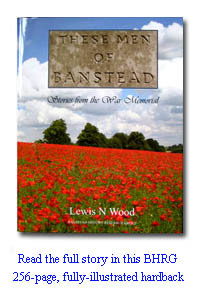 Thus both brothers are listed on the Banstead War Memorial. Grave Reference: III. D. 13.